As soon as March hits, I start thinking about spring, and getting everything spruced up outside. I really wanted some adorable farmhouse patio furniture for our front porch, and was so excited when I found just the perfect thing. 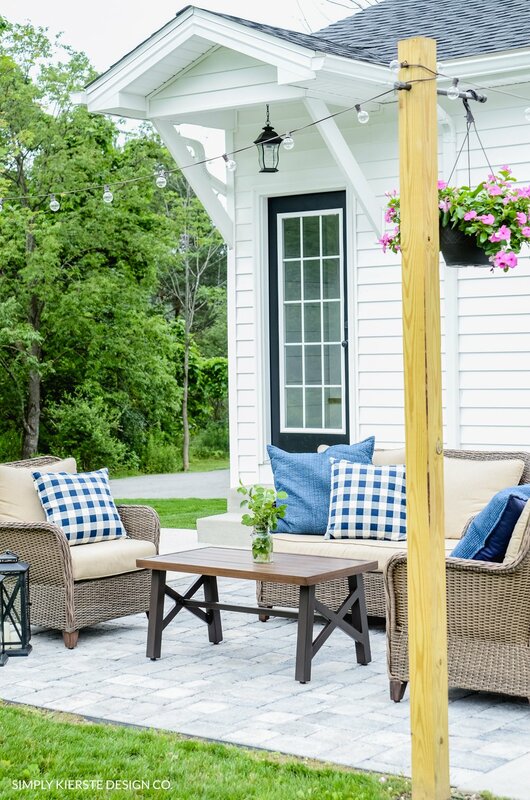 Even with a bunch of snow on the ground, it’s not too early to start thinking about my outdoor spaces, and it makes me even more excited for spring and summer! This post is sponsored by Better Homes & Gardens at Walmart. All opinions about their adorable product is 100% mine. I was SO excited to come across this darling bistro table at Walmart, by Better Homes & Gardens. It’s perfect for sitting out on the porch with lemonade in the spring and summer, and hot chocolate in the fall and winter. I love the top of the table…a lot. My daughter said to me “it looks like our bathroom floor!” It totally does. And it’s perfect! To go with the table, I decided on my most favorite industrial farmhouse chairs. Ever. They’re absolutely perfect with this table, but it’s kind of hard to find a place where they don’t work. They’re great for both indoors and outdoors, and they’re just SO cute. I have them all over my house too! 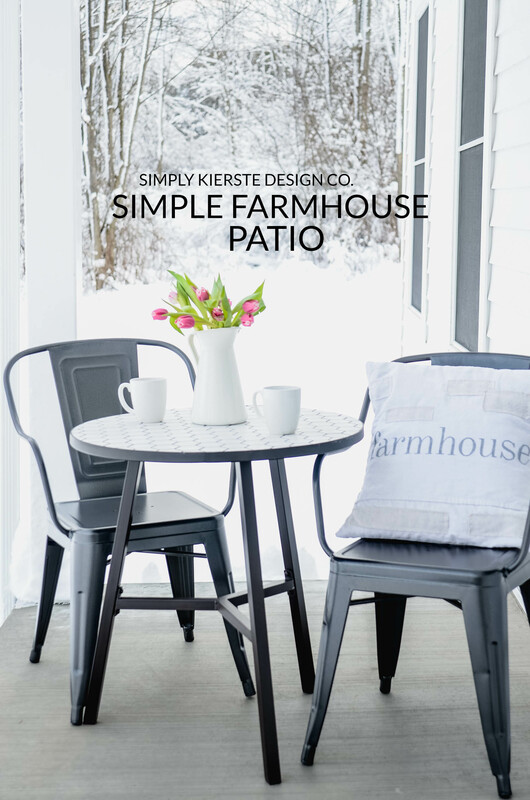 They add the perfect amount of farmhouse charm to my patio set. If you’re looking for a pop of color, they also come in the cutest teal color. They’re all available from Better Homes & Gardens at Walmart–although the gray chairs you can only get in-store. I love this it’s simple, but stunning. It’s a classic look that can go with any color, and you can pillows and rugs to change up the look as you like–or for seasons and holidays. It’s so fun to be able to add pillows and throw blankets for Christmas, Halloween, summer, Thanksgiving, etc. That’s why neutrals are my very favorite–I have a beautiful palette that I can change or add a little color, as it changes throughout the seasons. You can also check out my backyard patio makeover using even more of my favorite farmhouse patio furniture! That table is adorable! It’s nice and neutral so the surroundings (and flowers) pop! Yes–I love using neutrals as my base, and adding in flowers and pillows, etc. for color! !